LookUp is a beautifully designed dictionary app that we first reviewed earlier this year. With its effective use of bold headings and colorful graphics atop a white background, Lookup visually looks like a sister app to Apple’s new App Store – and considering how much I love the new App Store, that’s high praise. I won’t spend any time on the basics of the app though, as you can check out Jake’s original review for that. Instead, I want to focus on how LookUp harnesses the power of new iOS 11 technologies. When it comes to iOS 11 developer frameworks that take advantage of the iPhone’s camera, ARKit is easily the most prominent. But there’s another important set of new tools leveraging the camera system: the Vision framework. Apple’s Vision framework enables live, high-performance image analysis, allowing apps to intelligently identify real-world objects using the camera. LookUp puts the Vision framework to use in a new feature called LookAround. 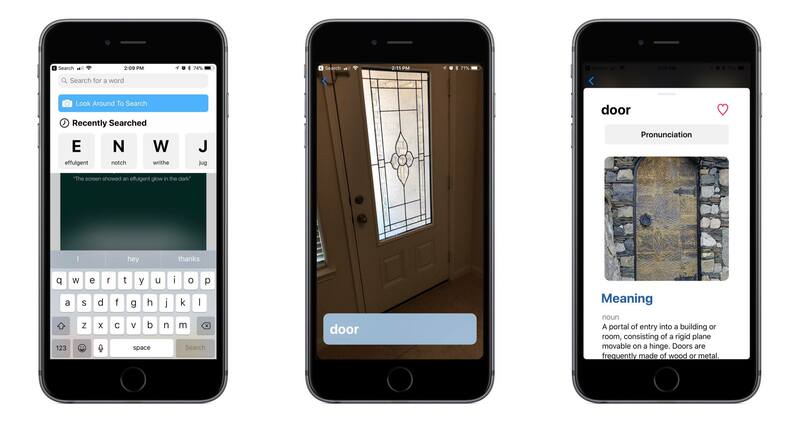 Accessed by tapping the search box at the top of the screen, then ‘Look Around To Search,’ LookAround allows you to point your phone at an object and have that object recognized by the app; once an object has been recognized, you can tap its name to load a definition for the word. The app uses a large database of possible objects, but there’s certainly more work to be done in this area to increase accuracy. With iteration it can grow into an extremely helpful feature to identify objects you’re unfamiliar with, but for now it’s a neat showcase of new tech. For optimal performance, make sure that only one object is in the camera’s view at a time. In addition to its Vision-powered LookAround feature, LookUp has also adopted support for iOS 11’s drag and drop in a few different ways. You can, of course, drag text out of the app, but you can also drop text into LookUp to load a definition – a handy addition. The more impressive drag and drop implementation is that you can drop an image into the app and, using the same machine learning model employed by LookAround, LookUp will recognize the image’s object and pull up a definition for you. The same rule applies here as LookAround – it’s best to stick with images that contain a single primary object. While I previously wouldn’t have used a dictionary app on my iPad nearly as much as my iPhone, LookUp’s excellent use of drag and drop makes me want to integrate the app as much as possible into my iPad workflows. One last addition worth mentioning is that LookUp now includes a few things you can visually customize. Most significant of these is a new dark mode for the app, which looks fantastic. You can choose to always keep the light or dark mode enabled, or have them trigger based on time of day or ambient light. You can also now select from a few different font choices: Avenir, Georgia, and Iowan join the default San Francisco, and font size can be tweaked as well. 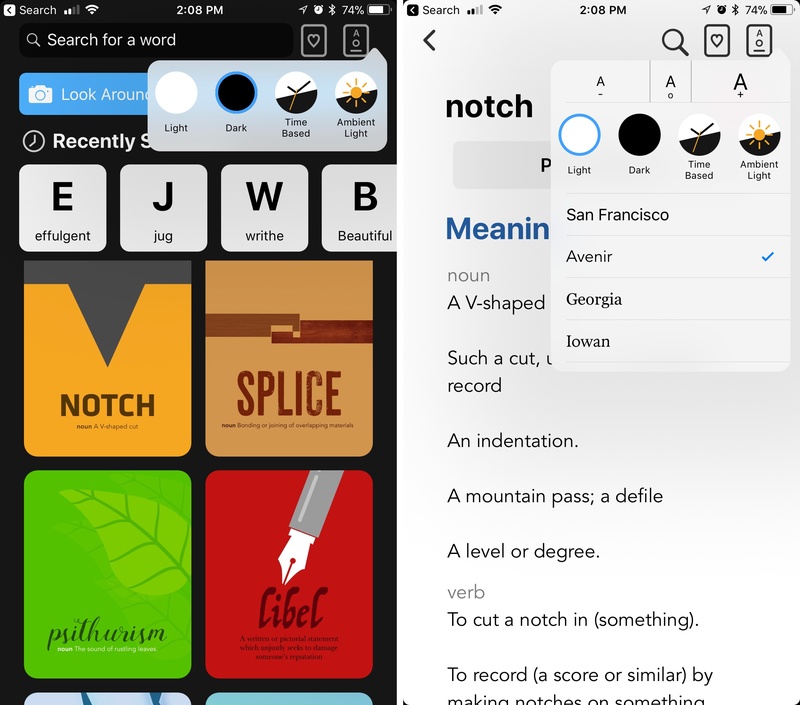 LookUp is the best looking dictionary app I’ve found, and now it’s paired that modern design with the most cutting edge technologies Apple has for developers – if you’re in the market for a dictionary app, look no further. LookUp 4.0 is available on the App Store.